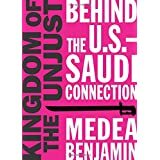 We are very pleased to announce that CPD is co-sponsoring two New York City events featuring Medea Benjamin, who has just launched a tour for her important new book Kingdom of the Unjust: Behind the U.S. Saudi Connection. On Sunday, October 23, we have joined with the Fifteenth Street Monthly Meeting of the Religious Society of Friends in Manhattan to host a meeting with Medea, and on Sunday, November 6, we are cosponsoring another Manhattan talk with Medea with Bluestockings. You can see the details about these two events and the entire book tour listing below. ADVANCE JUST PEACE IN THE MIDDLE EAST? like Saudi Arabia and Israel reduce violence and oppression in the region? copies of which will be available for purchase during the event. All are welcome. The presentations will be followed by refreshments and discussion. Event: "An Evening with Medea Benjamin"